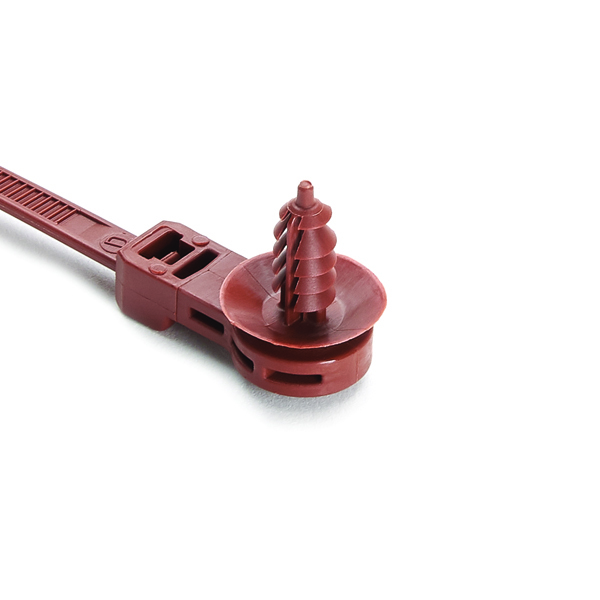 • One-piece cable tie and fixing offers a simple and easy to use method of bundling and fixing cables, through the design of the fir tree by ensuring positive and secure fixing into panels with thicknesses from 0.8mm to 7.0mm or threaded blind holes. • The offset on the cable tie creates an alternate solution when an offset fixing option is required and a tape clip cannot be used due to the design which reduces the potential of the bundle flexing or shifting. • The 'disc' on the top of the fir tree covers the hole and minimizes the ingress of water and dirt. • One-piece cable tie and fixing offers a simple and easy to use method of bundling and fixing cables, through the design of the fir tree by ensuring positive and secure fixing into panels with thicknesses from 0.8mm to 7.0mm or threaded blind holes. • The offset on the cable tie creates an alternate solution when an offset fixing option is required and a tape clip cannot be used due to the design which reduces the potential of the bundle flexing or shifting. • The 'disc' on the top of the fir tree covers the hole and minimizes the ingress of water and dirt. HellermannTyton's offset fir tree cable tie family creates an offset routing solution for our customers who are moving away from using tape. The offset branch creates a strong offset that reduces flexing and shifting of the bundle.